10 Eminem Inspirational Songs To Keep You Motivated - Motivate Amaze Be GREAT: The Motivation and Inspiration for Self-Improvement you need! In The late 90s there was this sort of "rebel rapper" coming out of nowhere, that seemed to scandalize a lot of people with his songs and lyrical content, but who also gathered the appreciation of teenage rebels. If we told you today that he's name was (and is) Eminem (alter-ego Slim Shady), you probably would not believe it. That just proves you how far Eminem has come as an artist and the learning experiences he gathered throughout his life and musical career. From the days of his dyed blond hair extra large white t-shirt, he developed into this musical icon that anyone knows something about. One of many Eminem musical qualities, is that he's not afraid of talking about what goes in his mind, so he literally uses music to express his feelings and what goes on in his own life. This is one of the reasons why so many people relates to his lyrics, we all have that Eminem song that touched us in an incredible way. 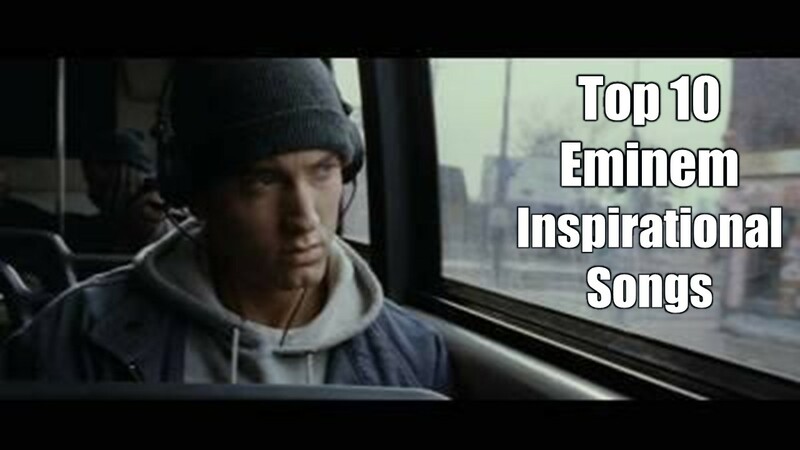 So, why not share this inspirational feelings with you by providing our selection of the top 10 Inspirational Eminem Songs of all time? 1. Eminem, "Till I Collapse"
The inspiration behind Eminem's song: This song relates to a time where Eminem was depressed and wasn't feeling capable of doing music anymore. Somehow he got the strength do get back up again and remember who he was despite the critics and general rumors about him. People always have an opinion, until they are in someone else's shoes and feel their pain. But you don't need others approval to know that you are beautiful inside, you define yourself not others. As long as you stay true to you and who you are. 3. Eminem, "Cleanin'Out My Closet"
The inspiration behind Eminem's song: This is a deep song, where Eminem goes all out expressing his feelings toward his childhood problems and essentially his relationship with his mother. The song title couldn't be more appropriate, cleaning out our closet his something that we all have to do sometime in life. This is a metaphor for leaving the past behind, so new things and new experiences can come to your life. Clean the old and make room for the new. Don't live in the past. Solve your past relationships and move on. The inspiration behind Eminem's song: This is a statement song where Eminem comes back stronger than ever, with a fresh philosophy in mind. Despite all life ups and downs he went trough, he's not afraid of taking a stand not matter what the circumstances are. That's how we all should interpret life, not being afraid of speaking our minds despite what negative things can come at us. And if you do so, you will see that rare, but unafraid people, will join you and make you stronger. The inspiration behind Eminem's song: This is a song for Eminem's daughter Hailie who was very young at the time this came out. Eminem comes out with the truth to his daughter about his life and relationship with this wife, so the child understands the struggles of being a single dad. This is a song about hope in a brighter future, despite all the drama around the family life. 6. Eminem, "Sing For The Moment"
The inspiration behind Eminem's song: Eminem discusses in his lyrics the repercussions of this music on the youth of the world and how it so differently interpreted depending on the perspective people have. For their fathers his music is a nightmare, for young teens his music gives them the freedom feelings they need to escape their troubled life. Despite all the controversy, again the message is clear, stay true to you and what your message is, sing for the moment, no matter what he will keep inspiring young people to be what they want to be in life. 7. Eminem, "The Way I Am"
The inspiration behind Eminem's song: Another song where Eminem brings out his in full his emotional side, this time around on an aggressively mode with his lyrics delivery. It talks about the pressures of fame and his career, but the whole essence is the hypocrisy of this world: whether his speaking the truth or just being funny, people will crucify him no matter what, so for that matter, Eminem uses this song chorus as a metaphor to describe the irony behind his fame. 8. Eminem, "When I'm Gone"
The inspiration behind Eminem's song: In this song Eminem creates the hypothetical scenario of him being gone of the music scene and it's a message to his fans not to be disappointed by it. First things comes first, and family comes first for Eminem, fans can celebrate him every time they hear his voice in the old records. What things come first in your life? Do you make this analysis often or do you just live life on a flow depending on what others want from you? The inspiration behind Eminem's song: This a remarkable video for the song, you can see Eminem and the relationship he has with his own monster, that is, the demons inside his head. We all have them, and those demons led Eminem to a bad place in the past, but now he know how to deal with the demons inside. What this means is: negative thoughts and demons will hit once in a while in life, but it's impossible to get ride of them, so what you have to do is to learn how to deal with them so they don't take control of your life. Don't underestimate the demons, because that's when they take over you, acknowledge them and control them. What would you do? No answer needed we know you do everything in your power to... Be GREAT! 21 Of The Most Inspirational Song Lines Ever! Do you like our list? Share with your friends. Tell us what songs are we missing.